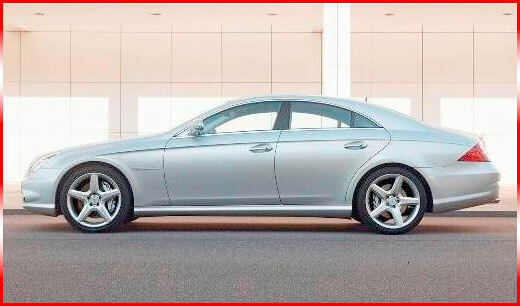 If you are looking for luxury motoring, then look no further than the Mercedes CLS320. Mercedes have always had a reputation for building high quality cars and the Mercedes CLS320 is no exception to the rule. Designed with low slung curves, the CLS320 is an attractive, 4 door executive saloon that is perfect for long motorway journeys, as a wedding vehicle or for airport transfers. The Mercedes CLS320 simply exudes class and is guaranteed to offer you a sublime journey. Inside the cabin of the Mercedes you will find all of the usual gadgets that you would expect from a car of this stature and the comfort and ride quality are difficult to beat. There is plenty of legroom for the passengers in the rear and with the powerful 3.0 litre engine the power delivery is silky smooth, providing you with enough torque to pull you effortlessly along. Although the CLS 320 is a superb touring vehicle, the car is no slouch and with a 0-60 time of 7 seconds, it can offer you enough thrills to keep you entertained and to put a smile on your face. If you are looking for a luxury, executive saloon that is flexible enough to be suitable for a variety of occasions, then the Mercedes CLS320 is definitely the car for you. Whatever occasion you are planning, the CLS320 is an excellent choice of vehicle and with our competitive prices and superb customer service, you can have the peace of mind that when you hire a vehicle from Midlands Limos, your car will arrive in perfect condition and on time. When you hire from Midlands Limos, we promise you that your lease hire experience will be a pleasurable one . If you have any questions about any of our vehicles then please do not hesitate to contact us, where we will be pleased to discuss your requirements and to offer you a free no obligation quote. All of our lease vehicles are available with or without a chauffeur and with our vast range of vehicles available, we are sure that we will have the suitable vehicle for you.